For the most part, people are not well-equipped to handle probabilities. When it comes to flying, either we imagine an uneventful flight and get on, or we imagine a crash and refuse to get on. Discussion of probabilities of various outcomes does little to influence behaviour. A good example of this phenomenon is the willingness of people to buy lottery tickets. In Canada’s Lotto 6/49, only 47% of money collected is returned in prizes. This means that the average $2 ticket gets back only 94 cents. And from an investment perspective, the volatility of the returns makes the ticket worth even less than 94 cents. Most businesses that sell goods attempt to sell extended warranties along with their electronics, furniture, and other items. Part of the sales pitch is to plant the idea that something could go wrong (but not until after you seem fully committed to buying the item). You imagine that something might go wrong, and you become tempted to buy the warranty. Of course, most of these goods have at least a year-long manufacturer’s warranty. Odds are that if something does go wrong, it will happen in the first year. And the price of extending the warranty to 3 years usually vastly overstates the odds that something will go wrong. Thus, the warranty price is almost pure profit. But, these facts carry little weight with people who become nervous and imagine their new purchase breaking. Online poker sites offer “free rolls,” which are tournaments that require no money to enter, but have prizes. The idea is to draw players in and ultimately get a fraction of them depositing some of their money to play. One free roll I’ve tried takes 9000 players and gives the top 72 players a ticket to a second level tournament (with about 5000 players) that pays a total of $2000 in prizes. The average player in the first level tournament gets only about one-third of a cent. However, the tournament has $2000 written at the top, and players imagine winning that money. Even financial advisors use the power of imagination to steer prospective clients. They start with gloomy projections about government old-age programs that leave you imagining being homeless and eating cat food. Then your new plan has a nice chart showing you retiring a millionaire, which conjures up images of an affluent lifestyle. Much of the advertising we see is designed to get us to imagine something that suits the advertiser. We would do well to focus on the numbers instead of our imaginations when it comes to big financial choices in life. 1. Rob Carrick reports that Canadians have too much money in low-yield savings. He says that with $65 billion in money market funds and another $60 billion in savings accounts, people are “missing a chance to participate in the stock market recovery and they're wasting opportunities to pay down debt.” I definitely agree with the paying down debt part. Unfortunately, cash on the sidelines has already missed a big part of the stock market recovery. 2. Canadian Capitalist points out that it is not just stock investors who underperform indexes; fixed income investors get lower returns than the bond indexes as well. 3. Big Cajun Man has a video from 1985 explaining how pennies are a waste of time. It’s sad that we still use pennies even though they’ve been near worthless for a generation. 4. At Where Does All My Money Go?, guest writer Daniela Garritano has some tips on maximizing the sale price on your home. 5. If you’ve ever had to pay income tax in instalments, you likely found the three options for the amount that you have to pay confusing. Million Dollar Journey explains the three options for income tax instalments. 6. Canadian Financial DIY brings us some research indicating that financial advisors do not bring enough value to offset the fees they charge. In a provocative interview titled “Buy GICs. Only GICs.”, Author and Chartered Accountant David Trahair advocates saving for retirement in GICs and avoiding the stock market altogether. His argument is that the gap between GIC returns and S&P/TSX returns has been small and GICs carry no risk. In his book Enough Bull: How to Retire well without the stock market, mutual funds, or even an investment advisor, Trahair ignored dividends from stock returns in his comparison with GICs and Canadian Capitalist took him to task for this. In the interview, Trahair quotes both returns with and without dividends. However, because the returns without dividends are irrelevant for comparison, we’ll ignore them. Stocks do perform better, but the gap does appear to be modest. However, it can be misleading to compare average returns over long periods like this. What actually happened to real money invested over this period? Over one decade, an initial investment of $10,000 in GICs grew to $13,900, but stocks ended at nearly double this amount: $24,600. For periods of 20, 30, and 40 years, the final value of stocks was more than double that of GICs, and for 50 years stocks gave more than triple. As the chart shows, the seemingly small average advantage of stocks added up to a big difference over long periods of time. A common problem as homes age is moisture or fog between the panes of glass in windows. Until a few years ago, I thought that the only solution was to replace the windows whose seals were damaged. This is an expensive proposition. I’ve since heard of companies that claim to be able to fix moisture-filled windows, but it’s hard to tell how legitimate they are. The window repair companies claim that they can solve moisture problems by drilling a hole in the window, inserting some moisture-absorbing material, and plugging the hole with a one-way valve to let moisture out. Every year my neighbourhood is filled with signs saying some variant of “Moisture problems in your windows? We can help!” The trouble is that every year the signs are different and the company name is different. This doesn’t exactly inspire confidence. From what I’m told, window repair is significantly cheaper than replacing windows, but it’s still expensive. And if window repair doesn’t really work, then paying for a repair and later replacing the window is the most expensive option. I’m interested in whether any readers have experience with these window repair companies. Do the repairs work? How long have your windows remained moisture-free? How expensive were the repairs compared to window replacement? 1. Rob Carrick explains the idea of rebalancing a portfolio. The part of rebalancing that investors seem to have the most difficulty with is shifting money into stocks after stock prices drop. It’s always possible to rationalize a change in rebalancing strategy to avoid buying stocks when prices are low and investors are nervous. 2. Thicken My Wallet explains deal fatigue as a negotiation strategy. I think I’ve been a victim of this one. 3. Larry Swedroe says don’t believe the hype about gold. 4. Preet explains the tax implications of a difference between Vanguard’s ETFs and other ETFs. 5. Canadian Capitalist gives us the lay of the land in Canadian high-interest savings accounts. 6. Big Cajun Man looks at monthly bank fees as an interest charge. He’s not too impressed with a chequing account with a negative 31% interest rate. Viewing bank charges as interest makes sense if the cost of providing the account is essentially nil. If the banks do have real costs, then it makes less sense. The truth is likely somewhere in between. 7. Million Dollar Journey gives 5 steps for simplifying your finances. 8. Scott Adams wrote a funny, but unrelated to money, post about inappropriate witticisms. The additional stories in the comments section are worth a look as well. Two Alberta men, Milowe Allen Brost and Gary Allen Sorenson, have been charged by the RCMP with allegedly running a Ponzi scheme that attracted more than $100 million from investors. The scheme’s marketing was based on gold mining and investors were promised a high rate of return along with tax advantages. RCMP were investigating the scheme for more than three years before charges were laid. This will be maddening for those who lost money over the last three years. To lose money in a scheme already believed to be a fraud by authorities has to be infuriating. This type of story is all too familiar lately. Shocked investors will be hoping that the money will be found, but if it really is a Ponzi scheme, it is very likely that almost all of the money is long gone. To investors in Ponzi schemes, it feels like the money disappears suddenly. In reality years of account statements were fantasies because the money was stolen over time. Some media reports feed into this feeling that investor money disappears suddenly just before the Ponzi scheme is detected. One gets the feeling that if authorities just look hard enough for the money, they might find it. Sadly, this just gives hapless investors false hope. Each year the Chartered Financial Analyst (CFA) Institute polls its members on the state of ethics and integrity of markets. The report on the integrity of Canadian markets came out recently showing less confidence in the effectiveness of Canadian regulatory and investor protections than those of other countries. This last suggestion sounds quite sensible to me. The fees people pay should be visible. Many Canadians would be shocked to learn how much they pay their financial advisors. The core argument of the book Worry-Free Investing, by Zvi Bodie and Michael J. Clowes is that stocks are too risky for most investors and they should invest in inflation-protected bonds (called I Bonds in the US and Real Return Bonds in Canada). The justification for this claim is in Chapter 6 where they show the results of some simulations. Monte Carlo simulations can be a good way to get a feel for the various possible outcomes of investing over a period of time. The authors use historical returns on US stocks from 1926 to 2000 to simulate a one-time investment of $100 in US stocks over 30 years to show what could happen. The outcome of Simulation 2 seemed very unlikely to me. I decided to run my own simulations based on choosing each year’s return randomly from the historical returns in Figure 6.2. Instead of only doing 3 runs, I let my PC go for a few hours, and it completed a billion runs. This is more than we need, but it gives a good picture of the possible outcomes. One thing I learnt was that 25-year olds are about 10 times more likely to die before the end of the 30 years than they are to get stock returns as bad as in Simulation 2. In only one out of every 140 simulation runs the stocks were worth less than $5200. In 87% of runs, stocks beat I Bonds. 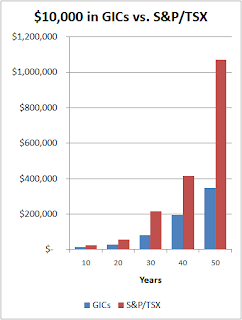 Half the time stocks were above $86,000 compared to I Bonds at only $24,300. If we accept Simulation 2 as a meaningful result even though it happens only once out of 140 times, what about the high end of stock return possibilities? In one out of 140 runs, stocks returned more than $1,060,000! The main result here is that the authors’ three simulations do not give an accurate picture of what is likely to happen. If that result of $5200 were just one out of a list of 100 simulation runs, it wouldn’t seem nearly so scary. This is a guest post by my wife who is going back to school and trying to save money on her textbooks. Hoping to avoid long line ups at the campus bookstore and hoping to save some money, I did some comparison shopping on both amazon.ca and chapters.ca. I was happy to find a savings of 12.5% compared to the campus store. The textbook prices at both online book sellers were identical before applying Chapter's iRewards savings and since I don't have an iRewards card anymore and since the savings were only half of the cost of a new card, I decided to order my 5 books from Amazon. All five of the books individually qualified for "Super Saver Shipping" (over $39 of merchandise) so my money wasn’t going to be eaten up by Canada Post. Three of the books were in stock and the other 2 would be shipped in 1-2 weeks. I still had time before classes started so there was time to complete the order. The first option Amazon presented me with was to choose a shipping speed: FREE Super Saver Shipping: (averages 2-3 business days) or Express (averages 2 business days for $13.70) or Priority (averages 1 business day for $20.94). I decided to go with FREE. I like FREE. The second option was to A: group the books and ship them all together or B: ship the books as they became available. If I selected B, it would cost me extra to ship the two books that weren't in stock. What happened to the free shipping that was advertised for each of the books? What Amazon was encouraging me to do was split up my one order for 5 books into 3 separate orders: one for the three books which were in stock and one for each of the 2 books which had a 1-2 week delivery time. Then the shipping would be free for all the books. Not willing to risk getting the books late for classes, I changed my Amazon order to include only the 3 in-stock books (they arrived 2 days later) and ordered the other 2 books from Chapters. One of those books arrived 3 days later and the other will be shipped, without extra charge, when it is available. In the end I saved over $70 by buying online instead of on campus, but perhaps my first lesson of the new school year is to make sure that FREE shipping means FREE, not FREE plus an extra charge. This is a Labour Day edition of the usual Sunday feature looking back at selected articles from the early days of this blog before readership had ramped up. Enjoy. I bought a scanner from a well-known chain store and was surprised to find a note inside the box explaining what was wrong with the scanner written by the last sucker who bought it. The note came with actual pictures of scans gone wrong. I’m grateful to this anonymous person who took the time to help out the next sucker to buy this scanner (me in this case). The two pages explaining the problem were not exactly hidden. They were the first thing that I took out of the box. Obviously the store employees never even looked inside. They just put it back on the shelf to sell it to someone else. Nice. I don’t see much point in naming the product or the store. But, I do like the consumer strategy of including a note any time you are forced to take a defective product back to a store. For your altruistic side, you get to help out other people. I just had a new high efficiency furnace installed. As most people are aware, the Canadian and Provincial governments are giving out a lot of money in an ecoENERGY program to help homeowners pay for energy-saving upgrades. With all the grants I’m promised, I’ll be paying for less than half of the furnace. The process for me began with choosing a supplier and making sure that the high-efficiency furnace I chose was on the approved list for grants. I negotiated a price of $4209 (including sales taxes). This is definitely a case of YMMV (you mileage may vary). The various grant amounts seem to change frequently. The final cost of the furnace to me is $1998, which is less than half of the starting price. Of course, it will take a few months for all of these grants to roll in, and while I did my best to understand how all this works, I can’t be sure I’ll get all my money until it actually arrives. Trying to choose a cellphone plan is very confusing. The many plans available have different features, and it takes a determined consumer to gather enough information to evaluate all of them. Worse still is that you can’t rely on one smart person to figure it all out because the best plan depends on how much you use your cellphone and what features you use. The Canadian government rides to the rescue. Industry Canada developed a calculator to figure out which plan would work best for you. This is a great idea; the government doing something fairly inexpensive to help many Canadians. Unfortunately, as Michael Geist reports, wireless company lobbyists convinced Tony Clement to kill the calculator (the web page with this article has disappeared since the time of writing). The official reason doesn’t matter because the real reason is obvious enough. Wireless companies make more money from confused consumers than they do from educated consumers. Cellphone plans are confusing because the wireless industry wants them that way. Fortunately, there are a number of new players competing in the cellphone market offering cheaper service, particularly for infrequent users of cellphones. The next time you have to choose a new plan, you’ll have to do the work yourself; the government won’t be there to help. Why Do Economists Use a Bell Curve if it Doesn’t Apply? Many economic theories, such as modern portfolio theory and Black-Scholes option pricing, are based on the premise that equity price distributions follow a Bell curve. In his book The (Mis)Behavior of Markets, Benoit Mandelbrot makes a strong case that the Bell curve gets it wrong. So, why do we still use theories based on the Bell curve? A partial answer is that a great many phenomena, such as human height, do follow a Bell curve (also called the Gaussian or Normal distribution). In fact, Bell curves come up so often that it is natural to suspect that it would apply to equity prices. 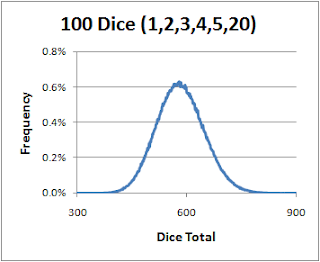 To see why Bell curves come up so often, let’s look at a simple example with dice. If we were to roll a die many times, we expect each face to come up roughly the same number of times. On a frequency chart, this would be a mostly flat curve. The result is a nice Bell curve with a peak at a total of 35 as we would expect. Whenever we add many independent random values together (as long as they aren’t too wild as I’ll explain later), the result tends to drift towards a Bell curve. This isn’t a perfect Bell curve, though. If it were, the odds of getting a total less than 10 would be about one in 9000. 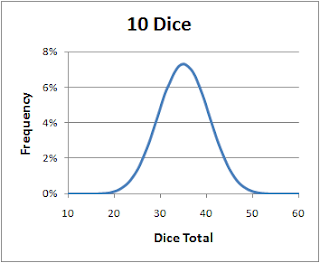 But the real probability of getting a total less than 10 using 10 dice is zero. The Bell curve models this situation well except for the most extreme events. The frequency chart still has a few small bumps, but it is now very close to the familiar Bell curve. So, even wild dice can be tamed if we add up enough of them. This tendency for all things to drift towards a Bell curve explains why economists would assume that equity price changes follow a Bell curve. A great many factors influence prices, and when we add them all together we might suspect that a Bell curve would pop out. However, Mandelbrot argues that the factors being added together are so wild that they cannot be tamed into a Bell curve. A good example of a wild distribution starts with a blindfolded archer standing between two long parallel walls. The archer spins around and fires arrows in a random direction. We then measure how far along the wall the arrows land. Most arrows won’t land too far away, but occasionally the archer will fire an arrow nearly parallel to the walls that will travel a long way. Even if we add up hundreds of arrow distances, there is still likely to be an arrow so far out that its distance dominates the total. 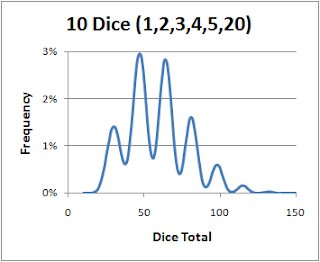 Unlike the dice with a 20 instead of a 6, the arrow distances cannot be tamed into a Bell curve by adding up many of them. These wilder distributions are much more likely to produce extreme events than a Bell curve, and Mandelbrot showed that real equity price changes are more consistent with wilder distributions. All this means that standard theory will give incorrect answers to some questions. Unfortunately, it isn’t easy to know which questions will be answered incorrectly. One thing to look for is situations where extreme events would sink a financial plan such as when an investor is highly leveraged.